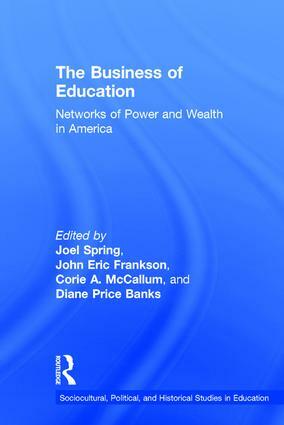 The Business of Education—a comprehensive view of how education policy is made in the US and, in some cases, globally—analyzes and critiques the influence of educational policy networks in a wide range of contexts and from a variety of perspectives, including testing, college preparation, juvenile detention centers, special education, the arts, teacher evaluation systems, education of undocumented immigrants, college faculty preparation, and financial aid. A network chart in most chapters illustrates how the major political actors, mainly private philanthropic foundations, for-profit companies, government officials, and politicians involved in the network, are linked. Joel Spring, internationally renowned scholar and analyst of educational policy, situates and frames the network studies in an introduction discussing general theories of education policy networks. Chapter 8 Exploring Federal Financial Aid Networks – Who Cares and Why? John Eric Frankson is Assistant Program Officer in the Office of Educational Opportunity and Diversity at the Graduate Center of the City University of New York, USA. Corie A. McCallum is Student Life Specialist/Student Conduct Advisor at New York City College of Technology/City University of New York, USA. Diane Price Banks is an Instructor in the Biological Sciences Department at Bronx Community College/City University of New York, USA.